In March 1983 the long awaited five-door hatchback range of cars from British Leyland, codenamed LM10 arrived on the scene. Originally designated ADO99 and intended as a direct replacement for the Austin Allegro, the project merged with LM11 (Montego Saloon) and became LM10. Development costs were quite astronomical and they were to be the first generation of cars from BL born of the CAD CAM age and it demonstrated their commitment to this exciting new technology. (CAD standing for Computer Aided Design and CAM standing for Computer Aided Manufacture). Michael Edwardes, during his chairmanship of BL had to make many economies in order to secure the funds for such ambitious projects, not least of which was the demise of Abingdon just 3 years earlier. LM 10 was intended to revitalise the flagging corporate image of BL, now renamed Austin Rover Group and designed to take the company into the late 1980s in a stronger market position. 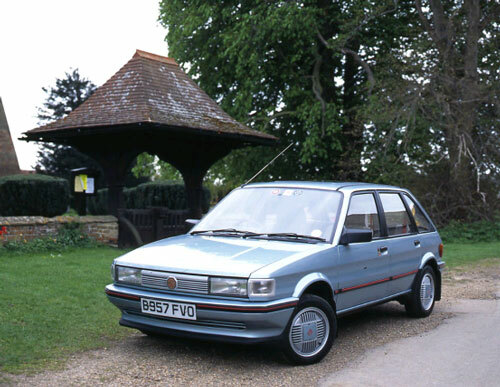 LM10 became the Maestro in March 1983 and the MG variant to be known as the MG Maestro 1600 was amongst the seven strong model launch. This was to be a high performance derivative offering over 110mph from a 102bhp R series engine. Designers were given a brief that it should offer very generous interior dimensions within a compact overall size, exploiting the packaging advantages of front wheel drive to the full. The overall exterior surface of the car was defined by computer in the design stages and the same computer data was fed to the presses to control the manufacture of the body panels. The Maestro was built at a new high technology plant at Cowley on the outskirts of Oxford where the vast majority of the assembly of the car was carried out by computer controlled robot machines. A bonus of the computer aided design was that simulated crash tests could be carried out to predict deforming of panels before full crash testing at MIRA. Optimum positioning of seat belt mountings and thicknesses of metal panels were also determined by computer, even the headlamp lenses were designed by computer to provide optimum efficiency coupled with the low bonnet line. These new type of lenses were called Homofocal and in terms of innovative technology, the Maestro was the first British car to feature these. The basic Maestro emerged as a well thought out but slightly uninteresting car, but had the potential as a good "bread and butter" earner. The MG as usual was to be the top of the range high performance derivative and was designed to corner another percentage point of the lucrative medium car market. The MG and Vanden Plas versions carried innovative full electronic instrumentation and a voice synthesis warning system, with the latter causing great consternation amongst the motoring press. The voice unit carried a 32 word vocabulary with messages such as "brake on", "fasten seat belts", "low fuel" and "low oil pressure". Autocar stated that the "Electronic fascia takes a little getting used to" and "Mercifully, to anyone allergic to unsolicited instructions, there is a restrict button!". Motor's view was that if the system insisted on telling you that you needed to fasten your seatbelt when you had already done so, it was a certain way of ensuring that the voice control switch remained in the "off" position. There was also for the first time on a British car, an advanced solid state electronic instrumentation system that was controlled by two microprocessors. Other than the trip meter there were no other moving parts and instead of the conventional speedometer cable there was an electronic sensor in the gearbox that sent speed signals to the computer which in turn activated vacuum fluorescent displays for engine revs, road speed, temperature and fuel tank level. A novel idea for those using their cars on the continent was the ability at the flick of a switch to change the speedometer reading from miles to kilometres per hour. Considering that the electronic gadgetry added nearly £200 to the selling price of the car it was a pity that the early dashboards were inaccurate and prone to premature failure. Only two engines were planned for the seven model range, one was the tried and tested evergreen A series 1275cc unit and the other was a brand new 1598 cc R series engine that had its parentage in the Maxi single overhead camshaft E series engine. The MG was to be powered by a special version of the 1600 cc unit and the desire was to have a high performance engine that was both smooth and tractable as well as exciting. Two twin choke downdraught 40 DCNF carburettors coupled to a low loss 8 port inlet manifold gave the extra power, whilst standard camshaft timing was retained for greater low speed flexibility, however the ports were enlarged from the standard engine. This increased the power output from a standard 81 bhp to 103 bhp @ 6000rpm. An end mounted close ratio 5 speed Volkswagen gearbox transferred the power to the road wheels which were a radial multi-bar pattern cast alloy type, fitted with Pirelli P8 low profile tyres. Suspension was the same as the standard models apart from a thicker anti-roll bar with the front utilising MacPherson struts and coil springs and at the rear an interconnected torsion bar trailing arm system was adopted.